Bookings are being taken for the Trust in Yellow coach to Southport´s away match at Wrexham next Tuesday 10 March. The coach departs the Merseyrail Community Stadium, Haig Avenue, at 5pm, with a fare of £12 members, £17 non-members if paid in advance. To book, call Bill Sloan on 07952056385 or visit the Trust office at one of this week's matches. 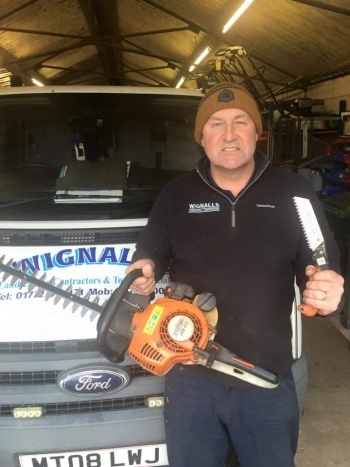 The Trust would like to thank Steve Wignall for his very generous donation to the Shave It Or Save It campaign. Steve, a great supporter of the club and the Trust, has also persuaded his good friend the Mad Barber of Bretherton, pictured above, to perform the shave. - Call in at the club shop or Trust office at the matches against Halifax Town on 3 March or Nuneaton Town on 6 March and put your money in the yellow tin to shave it or black tin to save it. - Through the Trust's PayPal above - Click donate and type ‘shave’ or ‘save’ in the comments box. - Via Just Giving https://www.justgiving.com/LukeGeorge/. Again, type ‘shave’ or ‘save’ in the comments box. The deadline for donations is 8th March. All Board members agreed that communication must be improved and an acknowledgement of an e-mail received should be made within 24 hours. Phil#180;s death has highlighted the need for new Board members with fresh ideas and skill sets. There are a few interested parties and they will be spoken to shortly. New roles such as a Projects Co-ordinator were discussed although it was agreed that it would be unfair to burden current Board members with either too many roles or roles that they aren´t keen on taking on. This heightens the need for a larger committee. Voting in the Trust in Yellow Player of the Month for February is now open. Every month throughout the season, fans are asked to nominate their star performer from the Southport team and one supporter will be selected to make the presentation to the winning player. You can vote using our online voting form HERE. February has seen a mixed set of results with performances improving as the month progressed. With three goals in four matches, including an excellently-taken equaliser against Macclesfield Town, Richard Brodie was the leading scorer during the month. The striker turned in a number of good performances, while Paul Rutherford, after waiting the best part of two seasons to score his first Southport goal, found the target at both Alfreton Town and Dover Athletic, securing the Sandgrounders a point. Or has another player caught your eye in February? Voting is open until 8pm on Friday 6 March and the presentation will be made ahead of the match against Nuneaton Town on Saturday 7 March. A polite reminder that all votes are vetted, so any multiple entries or ones submitted without a name or valid e-mail address will not be counted. Since the award was introduced, the club's junior supporters have taken real delight in making the presentation to the winning player. In a slight change to previous seasons, you can now nominate yourself, your child or any other friend or family member to present the award by contacting the Trust in the same ways you can vote above. The Player of the Month award is one of several initiatives run by the Trust to promote greater supporter-involvement and strengthen the link between fans and players.